On a still night at Phillipskop during spring, the air is filled with a beautiful but elusive scent. 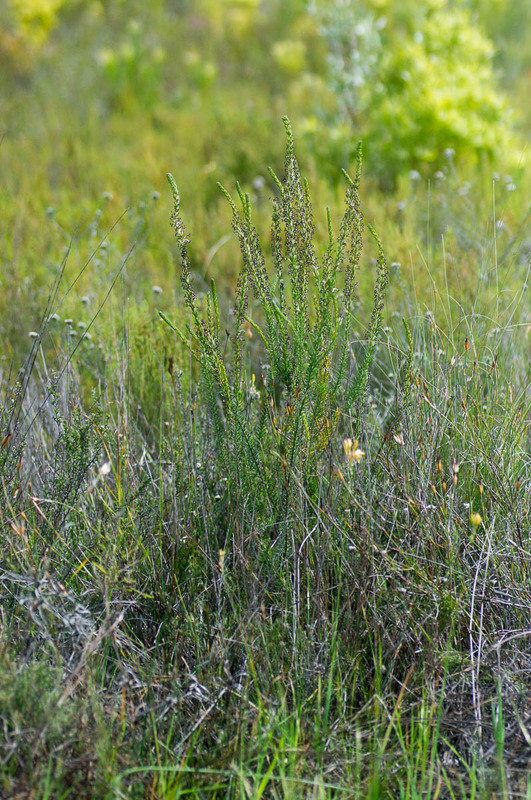 A cat’s tail would not be the first place one would go when hunting down such a scent, but in the fynbos that is one of the primary sources of night-time fragrance. 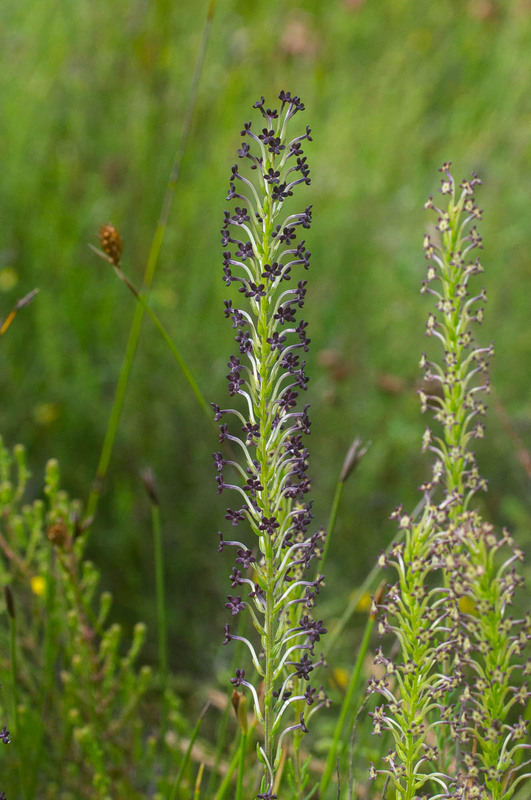 The plant, for that is what the cat’s tail or katstert refers to in this case, is called Microdon dubius. 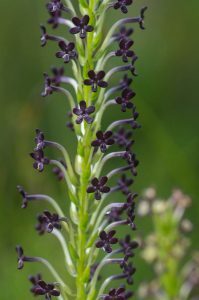 It is easily overlooked during the day due to its small flowers and dull colours, but at night it comes into its own, surpassing many a more flamboyant flower. The common name cat’s tail is because it produces a very narrow long spike of flowers that, in someone’s eyes, was reminiscent of the tail of a contented cat poking up through the fynbos. Microdon dubius is a member of the figwort family, Scrophulariaceae. 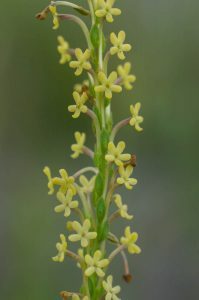 Members of this family have a tubular flower with 5 lobes at the end. In Microdon, the tube is very long compared with the size of the lobes. This narrow curved tube is perfect for moth pollination and the evening scent helps to attract the moths to the flowers. 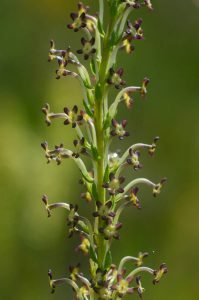 The flowers themselves do not particularly need colour but interestingly, although not colourful, they come in a surprising array of colour forms. The commonest forms are a creamy greenish white or a dark maroonish black. But between these two extremes many other colour forms exist, some tending towards dark red, while others have bicolored flowers with the central parts cream and the outer lobes dark. Usually several different colour forms exist within the same population. 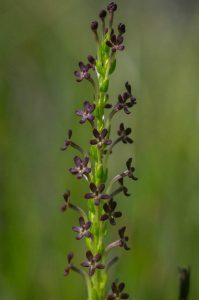 Microdon dubius is not in general cultivation, but it should be for its night-time fragrance alone. Unlike many fynbos plants it continues to flower for a long season, from June to December, though peaking in spring. With such natural variety in colour forms, it should also be possible to select plants that provide daytime interest as well as the night time highpoint. The name Microdon, first coined in 1823, comes from the Greek for small tooth, referring to the small teeth on the calyx. The species epithet, dubius meaning doubtful, was given much earlier by Linnaeus in 1753. However, at the time he placed it in the genus Selago but with the proviso that he was not sure it belonged there. 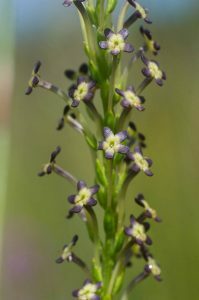 It was not until 1999 that it eventually found its way into its current genus having for a long time sat in the genus Agathelpis. Cats Tail, December, July, June, Katstert, Microdon, moth-pollinated, night-scented, November, October, scientific name, Scrophulariaceae, September, Spring. Bookmark.